Lara Guercio is Senior Counsel in the firm’s Billing Commercial Department. Lara’s practice focuses on general commercial real estate matters, including acquisitions/dispositions, development, financing, land use and leasing. She also practices environmental law, including environmental permitting and compliance. 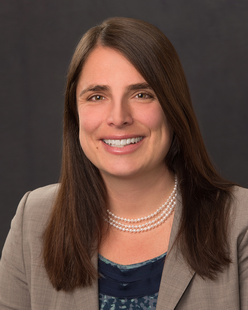 Her recent environmental work provides detailed analysis and review of Superfund, natural resource damage, and Clean Water Act liability issues. Lara has worked on renewable energy matters, as well as public utility infrastructure upgrades and developments. Prior to joining Crowley Fleck, Lara was an associate in the Boston office of Goulston & Storrs. Lara received her J.D. in 2008 from the University of Michigan Law School, a LL.M. in Environmental Law from Vermont Law School, and a B.A. in Environmental Studies from Middlebury College.